Estate (private use): approx. 250 m², partially self-contained (fence), in a hillside. 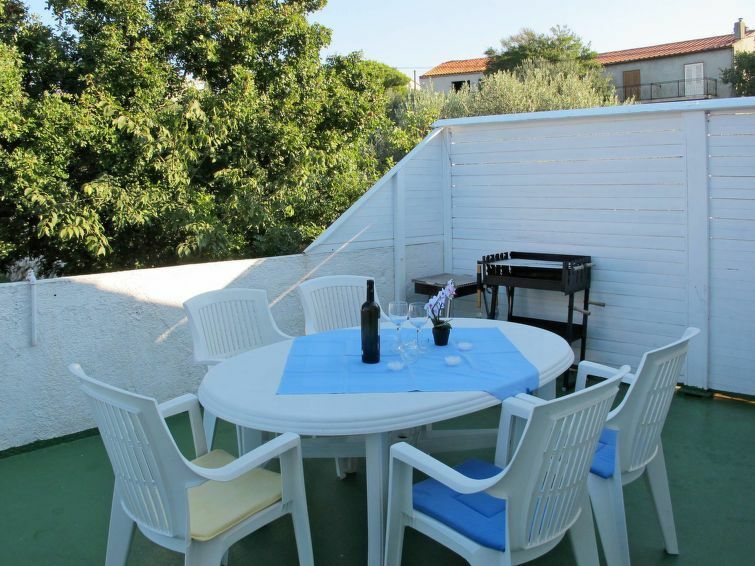 Outdoor facilities(private use): terrace 24 m², furnishing provided, transportable barbecue. Center Punat in approx. 500 m. Krk in approx. 7 km. Baska in approx. 17 km. Next shopping possibility (Punat) in approx. 300 m.
Airport Rijeka/Krk in approx. 32 km. Sea in approx. 800 m. Pebble beach in approx. 800 m.
detached house, 3 - 5 people, 3 room/s, 2 bedroom/s, 2 bathroom/s, approx. 66 m², 2 floor/s. Equipment: satellite TV; internet access Wi-Fi (included); washing machine; combined heating/air conditioning (not available on all floors); electric radiator. Living room/bed room(ground floor): double sofa bed, exit to terrace. From the living room stairs to upper levels. Kitchen: open to the living room (ground floor). Kitchen/ cooking equipment: 4 electric plates, oven, microwave oven, refrigerator, coffee machine, water boiler, toaster. Bedroom 1(floor 1): double bed (1.60 m wide), exit to terrace. Bedroom 2(floor 1): single bed. Sanitary 3(ground floor): separate WC. Local service charges Holiday resort tax. Linen/towels Bed linen available. Towels must be brought along. Change of bed linen every 7 days included. Deposit € 100 (in cash). Cot € 10 per stay (on order). Pet 2 animals allowed, € 25 per pet and stay (please advise prior to arrival).